Our little house is overflowing with vintage goodness once again! *A special feature of our Summer Sale is a HUGE yard sale in the backyard on Friday & Saturday! We restock daily! It will be fun, fresh and fabulous! How do you not keep all these goodies for yourselves? Fabulous! I spy several things I'd HAVE to bring home with me!! Happy sale!!! Oh my goodness. This is always the time of the year, I wish I lived closer. So many wonderful things to admire virtually. I know they would be swoon worthy in person. I can't wait to see what Megan buys from you! I cannot wait to come! Everything looks amazing. There are so many beautiful pieces!! Of all of them, the kelly green one makes my heart skip a beat :0) You're so talented! Wishing you a successful tag sale. You gals are awesome (and busy!) to have so many unique and great pieces/finds ready for several tag sales each year! Wishing you a fantastic sale! Sharon, every time you post about one of your sales, I drool and wish I lived close enough to take a little drive! Ah, maybe someday! Have a wonderful sale! 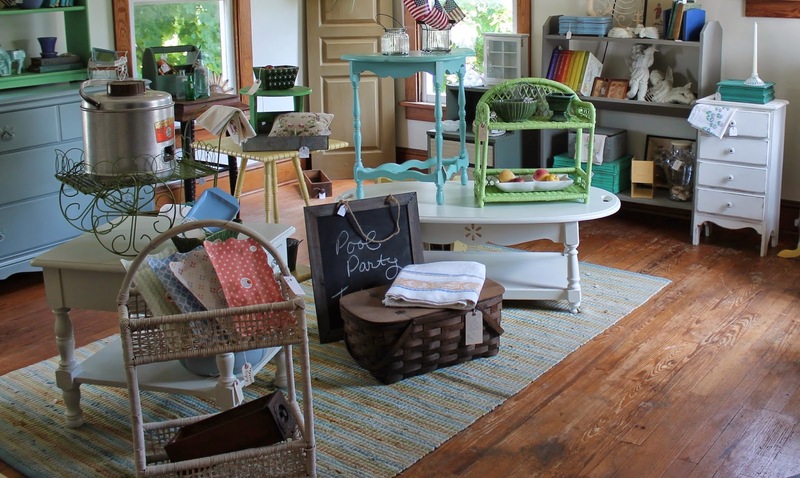 As always, you've filled the little house to the brim with amazing furniture and treasures! Wish I lived closer :) Good luck on a fabulous sale!! maybe someday, I'll take a road trip! Love seeing all the goodies, the one that caught my eye is the red dresser. Beautiful!